Mark Knee sent in this picture of the boat his father Daniel built. It is a Standard Fly Drift Boat which Daniel and Mark use for fishing trips on the Pere Marquette River and the Big Manistee River, trying their luck at trout, steelhead, and salmon fishing. 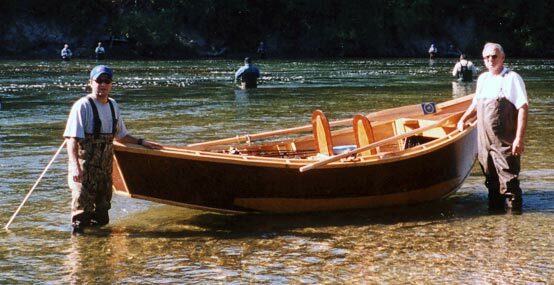 The name of the 14'8" craft is GADID, which means "knee" in the Ottawa Indian language. GADID was launched on September 20, 2003 for a salmon fishing trip. Daniel built the boat in 250 hours and got the plans from Don Hill boats, www.dhdriftboats.com.